Please click here to sell your Ben Messick painting or receive a free art evaluation of your piece. Click to review some of the paintings we've recently purchased by Ben Messick. Ben Messick was born in the Ozarks and spent his childhood there. When he was sixteen, Messick joined the armed forces and was sent to the European battle front. 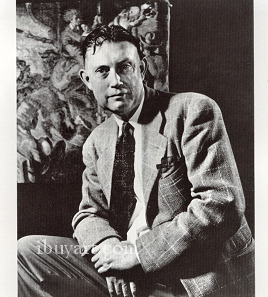 After recuperating from his wartime experiences, he moved to Los Angeles and studied with F. Tolles Chamberlin, Clarence Hinkle and Pruett Carter. By the mid-1930s, Ben Messick had developed his own style of painting and became known as one of the West Coast's key Regionalist artists. While Messick was an extremely competent watercolorist, these works were not exhibited frequently and did not receive the attention given to his oils on canvas. During the 1940s and early 1950s, he taught life drawing at the Chouinard Art Institute and the San Diego School of Arts and Crafts. He was also an instructor at the Messick-Hay Studio in Long Beach. In addition, he produced and exhibited lithographic prints. Ben Messick biography posted with permission of �California Watercolors 1850-1970� by Gordon T. McClelland and Jay T. Last. Copyright Hillcrest Press, Inc. 2002.